Dress up your game table with this gorgeous tournament game arm chair with casters. 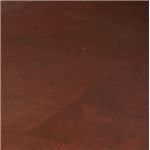 Choose from the black leather or warm brown leather finish to coordinate with your game table top. Classic curvature, a box seat and brass nail head trim adorn this arm chair. Functional casters allow for easily mobility around a room and come in handy while playing a game of poker. Pair with the game table to complete the look in your home entertainment or dining room. The Tournament Tournament Game Arm Chair with Casters at Morris Home in the Dayton, Cincinnati, Columbus, Ohio, Northern Kentucky area. Product availability may vary. Contact us for the most current availability on this product. Whether playing poker, black jack, enjoying an intimate dinner or entertaining guests, this elegant game/dining table and arm chair set collection will provide unmatched design in your home. The Tournament Collection features two different game table tops in a black or warm brown finish. Flip the table top over to reveal either a warm brown or black center with cup holders and money holders. 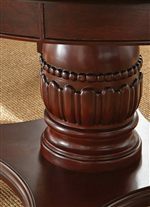 It features a carved pedestal base with detailed wood work that will bring a gorgeous appeal to your home. 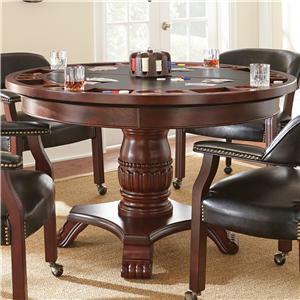 This game table is an ideal addition to any dining area or game room in your home. Pair with four exposed wood leather arm chairs with casters. Either choose the brown leather or black leather coordinating with your game table top. 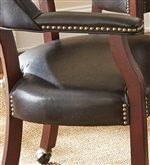 A brass nail head trim lines the chairs and adds a sophisticated finishing touch. 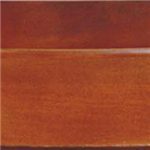 The Tournament collection is a great option if you are looking for Traditional furniture in the Dayton, Cincinnati, Columbus, Ohio, Northern Kentucky area. Browse other items in the Tournament collection from Morris Home in the Dayton, Cincinnati, Columbus, Ohio, Northern Kentucky area.